Lo, P., Chiu, D. K. W., Cho, A., & Allard, B. (2018). 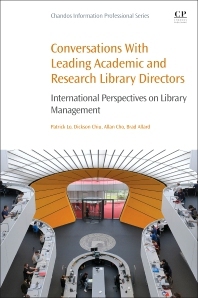 Conversations with leading academic and research library directors: International perspectives on library management. Oxford: Chandos Publishing. Chandos Publishing released the 1st edition of Conversations with leading academic and research library directors at the end of 2018. Available in both e-book and print format, this edited volume consists of interviews with academic and research library directors. The monograph consists of 30 chapters, and features 30 library directors. The library directors share personal anecdotes about their careers, and insights into the contemporary demands on library leadership. Among them are the directors of Oxford’s Bodleian Library, the Harvard Library, and the Free University Berlin Library. The University Librarians of the University of Hong Kong, Chinese University of Hong Kong, Singapore Management University, and Peking University each contribute a chapter, which will be of particular interest regionally. This book appeals to library leaders and those who aspire to library leadership, but it also provides useful insights into the future of libraries for any library professional or library student. The book is neatly structured, with each chapter dedicated to one library director and taking an easy-to-read question-and-answer format. Look for this book in your library collection, or shop for it online (https://www.elsevier.com/books/conversations-with-leading-academic-and-research-library-directors/lo/978-0-08-102746-2).